When I read about Scotland’s wave power in this week’s Newsweek I was excited but disappointed. Disappointed because the USA is not leading the initiative on wave power. Pelamis on site at EMEC, the planned location for Scotland’s first wave farm. Various systems are under development at present aimed at harnessing the enormous potential available for wave power off Scotland’s coasts. Pelamis Wave Power (previously Ocean Power Delivery) are an Edinburgh-based company whose Pelamis system has been tested off Orkney and Portugal. These devices are 150 metres (492 ft) long, 3.5 metres (11.5 ft) diameter floating tubes which capture the mechanical action of the waves. Future wave farm projects could involve an arrangement of interlinked 750 kW machines connected to shore by a subsea transmission cable. Another approach is used by the LIMPET 500 (Land Installed Marine Power Energy Transformer) energy converter installed on the island of Islay by Wavegen Ltd. It is a shore-based unit and generates power when waves run up the beach, creating pressure inside an inclined oscillating water column. This in turn creates pneumatic power which drives twin 250 kW the generators. Islay LIMPET was opened in 2001 and is the world’s first commercial scale wave-energy device. The manufacturers are now developing a larger system in the Faroe Islands. The Siadar Wave Energy Project was announced in 2009. This 4 MW system was planned by npower Renewables and Wavegen for a site 400 metres off the shore of Siadar Bay, inLewis. However in July 2011 holding company RWE announced they were withdrawing from the scheme, and Wavegen are seeking new partners. In early 2010 two areas were identified for substantial offshore wind development, in the Moray Firth basin and outer Firth of Forth. Shortly afterwards the Government earmarked eleven sites they expected to benefit from the construction of up to 8,000 offshore turbines by 2020. These included Campbeltown and Hunterston, four sites previously used for offshore oil fabrication atArdersier, Nigg Bay, Arnish and Kishorn and five east coast locations from Peterhead to Leith. In May 2010 the “Vagr Atferd P2″ Pelamis 750 kW system was launched for testing by EMEC. The device weighs 1500 tonnes and is 180 metres long. Pelamis Wave Power Ltd is the manufacturer of a unique system to generate renewable electricity from ocean waves. For energy companies, utilities and their customers, Pelamis machines offer the ability to unlock an immense clean energy resource with great potential. To see the Pelamis in actionclick here. The Pelamis Wave Energy Converter is the result of many years of engineering development by PWP. It was the world’s first commercial scale machine to generate electricity to the grid from offshore wave energy and the first to be used commercially. For details about how the Pelamis works and to read about our new P2 device, click here. For details of recent machine operations and testing, click here. Offshore wave energy has the potential to be one of the most environmentally benign forms of electricity generation. The wave energy around the British Isles has been estimated to be equivalent to three times current UK electricity demand, with the potential to convert a sizeable fraction of this wave energy to electricity. Many other areas of the world also present possible opportunities for wave power conversion. To discover what areas could be potential sites for wave technology in future, click here. Click here to learn more about Pelamis Wave Power. In the design and construction field, there are two major categories of resources: renewable and non-renewable. As opposed to non-renewable resources, which are depleted with their constant use, renewable resources are not. If not managed properly Non-renewable resources might become non-existent when the rate at which they are used is much higher than the rate at which they are replaced. Renewable resources include water, geothermal energy and wind energy. Non-renewable resources include coal, natural gas and oil. The demand for new construction is on the rise as the world’s population increases and the demand for newer, more efficient modern buildings also increase. Because buildings account for so much energy to build and maintain, architects and designers have become very conscious about our role in minimizing our environmental footprint when we design buildings. The American Institute of Architects, the largest organization of architects world-wide has a committee called the Committee on the Environment (COTE), which works to advance, disseminate, and advocate—to the profession, the building industry, the academy, and the public—design practices that integrate built and natural systems and enhance both the design quality and environmental performance of the built environment. COTE serves as the community and voice on behalf of AIA architects regarding sustainable design and building science and performance. In green construction processes, there is an emphasis on the use of renewable resources. In many cases, this natural source becomes depleted much faster than it is able to replenish itself, therefore, it has become important that buildings make use of alternative water sources for heating, hot water and sewerage disposal throughout their life cycles, to reduce use and conserve water supplies. Architects and designers specify rapidly renewable materials are those that regenerate more quickly than their level of demand. Our goal is to reduce the use and depletion of finite raw materials and long-cycle renewable materials by replacing them with rapidly renewable ones. Some commonly specified rapidly renewable materials include cork, bamboo, cotton batt insulation, linoleum flooring, sunflower seed board panels, wheat-board cabinetry, wool carpeting, cork flooring, bio-based paints, geotextile fabrics such as coir and jute, soy-based insulation and form-release agent and straw bales. Some green building materials products are made of a merger of rapidly renewable materials and recycled content such as newsprint, cotton, soy-based materials, seed husks, etc. Check out this ILMA article about “Materiality and Green Architecture: The Effect of Building Materials on Sustainability and Design” for more information on this topic. Architects and designers who align with AIA’s COTE objectives, (1) recognize the value of their role in environmental leadership to advance the importance of sustainable design to the general public while incorporating sustainable design into their daily practice, (2) influence the direction of architectural education to place more emphasis on ecological literacy, sustainable design and building science, (3) communicate the AIA’s environmental and energy-related concerns to the public and private sectors and influence the decisions of the public, professionals, clients, and public officials on the impact of their environmental and energy-related decisions, (4) educate other architects on regulatory, performance, technical and building science issues and how those issues influence architecture, (5) educate the architectural profession on programming, designing, and managing building performance, (6) investigate and disseminate information regarding building performance best practices, criteria, measurement methods, planning tools, occupant-comfort, heat/air/moisture interfaces between the interior and exterior of buildings, (7) promote a more integrated practice in order to achieve environmentally and economically efficient buildings. One of the tools we will plan to promote to achieve this integration is Building Information Technology (BIM). PLP Architecture and the Developer OVG Real Estate, built “The Edge” is a 430,556 SF (40,000m²) office building in the Zuidas business district in Amsterdam. It was designed for the global financial firm and main tenant, Deloitte. The project aimed to consolidate Deloitte’s employees from multiple buildings throughout the city into a single environment, and to create a ‘smart building’ to act as a catalyst for Deloitte’s transition into the digital age. Each facade is uniquely detailed according to its orientation and purpose. Load bearing walls to the south, east and west have smaller openings to provide thermal mass and shading, and solid openable panels for ventilation. Louvers on the south facades are designed according to sun angles and provide additional shading for the office spaces, reducing solar heat gain. Solar panels on the south facade provide enough sustainable electricity to power all smartphones, laptops and electric cars. The North facades are highly transparent and use thicker glass to dampen noise from the motorway. The Atrium façade is totally transparent, allowing views out over the dyke, and steady north light in. The building’s Ethernet-powered LED lighting system is integrated with 30,000 sensors to continuously measure occupancy, movement, lighting levels, humidity and temperature, allowing it to automatically adjust energy use. 65,000 SF of solar panels are located on the facades and roof, and remotely on the roofs of buildings of the University of Amsterdam – thereby making use of neighborhood level energy sourcing. The atrium acts as a buffer between the workspace and the external environment. Excess ventilation air from the offices is used again to air condition the atrium space. The air is then ventilated back out through the top of the atrium where it passes through a heat exchanger to make use of any warmth. Rain water is collected on the roof and used to flush toilets and irrigate the green terraces in the atrium and other garden areas surrounding the building. Two thermal energy wells reach down to an aquifer, allowing thermal energy differentials to be stored deep underground. In The Edge a new LED-lighting system has been co-developed with Philips. The Light over Ethernet (LoE) LED system is powered by Ethernet and 100% IP based. This makes the system (i.e. each luminaire individually) computer controllable, so that changes can be implemented quickly and easily without opening suspended ceilings. The luminaires are furthermore equipped with Philips’ ‘coded-light’ system allowing for a highly precise localization via smartphone down to 8 inches (20 cm) accuracy, much more precise than known WiFi or beacon systems. Around 6,000 of these luminaires were placed in The Edge with every second luminaire being equipped with an additional multi-sensor to detect movement, light, infrared and temperature. Remote insight into the presence of people in the building (anonymous). Heating, cooling, fresh air and lighting are fully IoT (Internet of Things) integrated and BMS controlled per 200 sqft based on occupancy – with zero occupancy there is next-to-zero energy use. Predictions of occupancy at lunchtime based on real time historical data and traffic and weather information to avoid food-waste. Unused rooms to be skipped for cleaning. Managers to be alerted to lights that need replacing. Notification of printers needing paper. Every employee is connected to the building via an app on their smartphone. Using the app they can find parking spaces, free desks or other colleagues, report issues to the facilities team, or even navigate within the building. Employees can customize the temperature and light levels anywhere they choose to work in the building via the mobile app. The app remembers how they like their coffee, and tracks their energy use so they’re aware of it. The vast amount of data generated by the building’s digital systems and the mobile app on everything from energy use to working patterns, has huge potential for informing not only Deloitte’s own operations, but also our understanding of working environments as a whole. Discussions are currently ongoing regarding the future of this data and its use for research and knowledge transfer. The green space that separates the building from the nearby motorway acts as an ecological corridor, allowing animals and insects cross the site safely. Because buildings account for nearly 40 percent of global energy consumption, architects and designers have been working to impact the built environment in a positive way. Although not every project can be as green as The Edge, by selecting materials that are renewable while reducing energy are two big contributions we can make to help ease the increasing demand for construction. Technology can play a big part in our role to design more sustainable buildings through the use of building information modeling, energy management software, building management software, online sustainability calculators, energy modeling software, new lighting innovations, new techniques to capture and deliver energy and clean water while reducing waste, and mobile applications utilizing IoT. We would love to hear from you about what you think about this post. We sincerely appreciate all your comments – and – if you like this post please share it with friends. Feel free to contact us if you would like to discuss ideas for your next project! 970 Denny, a residential high-rise under construction in South Lake Union, used early energy modeling to demonstrate that efficiency from the water source heat pump system would offset increased thermal loss from expansive glazing. Airtight construction controls the transfer of heat and moisture into and through the building envelope. Thermal bridge-free assemblies avoid the envelope penetrations that sap buildings of energy, comfort, and durability. Continuous insulation keeps heat where it’s wanted. Excellent windows and doors limit heat loss while capturing daylight and passive solar energy. Shading elements shield the building from passive solar gains when unwanted. And a constant supply of filtered fresh air comes in through a balanced heat recovery (or energy recovery) ventilation system that recaptures the thermal energy of exhaust air and keeps it inside the building. “Envelope-first” focus design consideration dramatically reduces the energy demand to heat and cool high-performance building. In fact, Passive House buildings routinely reduce heating and cooling energy by up to 90%. The “High Performance by Integrative Design” film by RMI includes examples of how design teams collaborate in new ways to integrate high-performance design elements, such as daylighting, energy efficiency and renewable energy, for optimal performance. Viewers experience charrette discussions and see the design process unfold on projects such as the Empire State Building retrofit, Missouri Department of Natural Resources, Phipps Conservancy in Pittsburgh, the Desert Living Center in Las Vegas, Willow School in New Jersey and Chicago Botanic Gardens. ID&CP processes and strategies can be implemented to varying degrees depending upon the complexity of a project and an owner’s project goals. A project team must be carefully assembled very early on in the process to ensure success. All key participants must subscribe to the collaborative effort of establishment clear goals. All project stakeholders must be involved and remain involved in the project, and must communicate openly and frequently. Key participants must employ appropriate technology to foster collaborative design and construction. Owner receives early cost estimating input, sometimes as early as conceptual design. Significant time can be saved because the design effort is emphasized and completed earlier in the process, and because construction can begin before the design is fully complete. Architectural and engineering fees can be reduced by the early involvement of the specialty contractors. Construction costs are minimized by incorporating constructability reviews into the process, and by the designers incorporating materials, methods, and systems that the team knows are more cost effective. Operating costs can be reduced by providing opportunities to greatly affect long-term energy and resource use through design. Capital costs can be reduced, thanks to clearer and better coordinated construction documents, which should minimize the incidence of change orders that impact both cost and time. Misunderstanding between the parties is minimized when the IPD Team works together during the planning stages of the project. The owner’s risk is minimized as the IPD Team approach tends to focus on early identification of potential conflicts and issues through the utilization of modeling tools. This early identification results in timely problem solving and resolution of issues through the use of models, as opposed to problem solving in the field and constructed environments. Frank Cunha III, AIA, NCARB is a Registered Architect licensed in CT, DC, DE, FL, MD, NJ, NY, PA and is currently seeking reciprocity in VA as well. Mr. Cunha is the founder of FC3 Architecture + Design, established in 2005 to serve its clients in various markets, including commercial and residential projects. He writes / blogs for I Love My Architect and Just Architecture. What was it about Architecture that helped you decide it was the field for you? I always loved to draw as a child and I always loved to build. Give me scraps of cardboards and leftover bricks and sticks in the backyard and my imagination would take over. I was always fascinated with churches and castles. They have a very obvious Archetype, and from a very early age I always imagined that I too would be able to one day shape the design of our cities and how people inhabit them. Even when I travel, it is the Architecture that defines the people and the place (unless you are in the wilderness, where nature rules supreme). In the city, man (men and women) are able to shape the world we live in. With this ability comes great responsibility not just freedom to do whatever we want. The industrial and post-industrial eras have taught us that! How long have you been in the profession? After 5 years of Architecture school and after 3 years of internship and after passing my NCARB IDP Architecture Exam I “officially” became a Registered Architect in January 2004. It was not easy but it was worth it. Going through the arduous process allowed me to learn the different aspects of being an Architect. It appears that Architecture incorporates many fields of study, for example; astronomy, meteorology, geography and I am sure there is much more. Could you explain? Throughout history, especially before technology and social media distractions, civilizations, would honor the heavens by building monuments. Examples of this can be seen all over the world and there are plenty of interesting websites that address this. Astronomy is one of the oldest sciences so it is no wonder that early civilizations would use the mathematics from the heavens to orient their buildings and monuments. Many pre-historic cultures left behind astronomical artifacts such as the Egyptian and Nubian monuments, and early civilizations such as Babylonians, Greeks, Chinese, Indians, and Maya performed methodical observations of the night sky. Climatology, the study of atmospheric science, is another extension coming out from Astronomy. In Architecture both the disciplines that is astrology and climatology, leads to a concept known as Vastu. If you want to learn more about these interdisciplinary studies, you can click here or click here. Today, Architects still consider orientation when placing a building and the building components on the site. The building’s orientation can even help Architects obtain LEED credits from the US Green Building Council, an organization that promotes sustainable design and construction around the world. Is there a deciding factor for you when agreeing to take part in projects? Is there a chemistry between the client and the designer, i.e., do you like each other? Can you work well together? Is the project exciting and challenging? Can I assemble the right team to complete the project effectively? And do we have the right fee to allow our design team to perform the project effectively? If the answer to any of these is “no” then I keep looking for another opportunity. Every time an opportunity passes, two or more new ones appear. Don’t be hasty just for the sake of getting a project! The projects you are sharing today are they based on specific concepts? As a young Architect my aesthetic and design concepts are still evolving. Although we do not force my designs on my clients, we do have some underlying principals we like to maintain on our projects whenever feasible. Maximize land, views, lighting, wind, water elements, other natural features, etc. Selection of Materials – Reuse, Recycling, Renewable sources, etc. For anyone in school considering Architecture as a profession, check out this great article by my colleague, William Martin, AIA. Click here to see some of Frank’s recent featured projects. Click here to read more “Ask the Architect” articles. Excerpt from “Freshhomes Design & Architecture”: Travessa de Patrocinio is one of those bohemian places in Lisbon that require a sweet disposition while visiting. The unique collaboration between these three designers, Luís Rebelo de Andrade, Tiago Rebelo de Andrade and Manuel Cachão Tojal, gave birth to a project inspired by minimalism, with an interesting Mediterranean “coverage”. Imagine a thick “coat” of plants shadowing the entire façade of a house that spreads vertically. “Its walls are completely covered with vegetation, creating a vertical garden, filled with around 4500 plants from 25 different Iberian and Mediterranean varieties which occupies 100 square meters. So, short levels of water consumption are guaranteed as well as little gardening challenges.” Click here to read the rest of the story. Excerpt from Architizer News: The House in Travessa do Patrocínio by RA\\ ( Luís Rebelo de Andrade, Tiago Rebelo de Andrade, Manuel Cachão Tojal) does just that. The narrow townhouse is situated smack dab in Lisbon, in a neighborhood with little access to green spaces. To compensate for this lack, the architects draped the house with lush green facades that cover 100 square-meters of wall space. But this isn’t your run-of-the-mill green building accessory. The facades are integral components to the architecture, not just tacked on for a higher LEED score. They’re planted with approximately 4,500 plants sourced from 25 different local varieties, which all require little maintenance. The result is a vertical garden that the architects say functions as an urban “lung” within the pavement-heavy area, helping to rid the residential street of excess noise, carbon, and other pollutants floating about. Click here to read the rest of the story. 3rd C. BCE to 17th C. AD: Throughout the Mediterranean, Romans train grape vines (Vitis species) on garden trellises and on villa walls. Manors and castles with climbing roses are symbols of secret gardens. 1920s: The British and North American garden city movement promote the integration of house and garden through features such as pergolas, trellis structures and self-clinging climbing plants. 1988: Introduction of a stainless steel cable system for green facades. Early 1990s: Cable and wire-rope net systems and modular trellis panel systems enter the North American marketplace. 1993: First major application of a trellis panel system at Universal CityWalk in California. 1994: Indoor living wall with bio-filtration system installed in Canada Life Building in Toronto, Canada. 2002: The MFO Park, a multi-tiered 300’ long and 50’ high park structure opened in Zurich, Switzerland. The project featured over 1,300 climbing plants. 2005: The Japanese federal government sponsored a massive Bio Lung exhibit, the centerpiece of Expo 2005 in Aichi, Japan. The wall is comprised of 30 different modular green wall systems available in Japan. 2007: Seattle implements the Green Factor, which includes green walls. 2007: GRHC launches full day Green Wall Design 101 course; the first on the subject in North America. 2008: GRHC launches Green Wall Award of Excellence and Green Wall Research Fund. An ‘active’ living wall is intended to be integrated into a building’s infrastructure and designed to biofilter indoor air and provide thermal regulation. It is a hydroponic system fed by nutrient rich water which is re-circulated from a manifold, located at the top of the wall, and collected in a gutter at the bottom of the fabric wall system. Plant roots are sandwiched between two layers of synthetic fabric that support microbes and a dense root mass. These root microbes remove airborne volatile organic compounds (VOCs), while foliage absorbs carbon monoxide and dioxide. The plants’ natural processes produce cool fresh air that is drawn through the system by a fan and then distributed throughout the building. A variation of this concept could be applied to green facade systems as well, and there is potential to apply a hybrid of systems at a large scale. #EcoMonday @FC3ARCHITECTURE – Going Green? We Can help! A “High Performance School” is a well-designed facility can enhance performance and make education more enjoyable and rewarding. A “High Performance School” is healthy and thermally, visually, and acoustically comfortable. It is also energy, material, and water efficient. A “High Performance School” must be safe and secure; easy to maintain and operate; commissioned; environmentally responsive site. Most of all a “High Performance School” is one that teaches and is a community resource. It should also be stimulating as well as adaptable to changing needs. Evidence is growing that high performance schools can provide learning environments that lead to improved student performance. Recent studies show that effective daylighting has contributed to improved student test scores by 10-20%. Intuitively quieter, comfortable classrooms with good lighting and good air quality yield better students/teachers. Low- and no-emission building materials can reduce odors, sensory irritation, and toxicity hazards. Efficient windows also reduce outside noise distractions. Improved heating and cooling systems permit students to hear the teacher better and avoid room temperature swings. Adequate lighting improves students’ ability to read books and see the blackboard. Considerations for “High Performance Schools”include: siting; indoor environmental quality; energy; water; materials; community; faculty and student performance; commissioning; and facilities performance evaluation. Siting is critical for “High Performance Schools” with regards to the environment, energy consumption, and indoor environmental quality, transportation, greenfields, endangered species, wetlands concerns, existing pollution on the site, and stormwater management. A key factor in site design is orientation of the building, which can influence passive heating, natural ventilation, and daylighting. Optimal orientation can reduce year-round heating and cooling costs and optimizes natural lighting. If possible orient buildings so that the majority of windows face either north or south. Strategic placement of vegetation can be used when this orientation cannot be utilized. Positive affects on the energy and environmental performance of a school include primary consideration for the environmentally sound school building. A school building should complement its environment. Working around existing vegetation to shade building and outside cooling equipment to reduce HVAC load help ensure good environmental performance of school by lowering energy bills and reducing local pollution. Locating a school near public transportation and within walking distance to a majority of students will further reduce energy use, while lowering local traffic and pollution. Stormwater management is vital to safety and ecological health of a school’s site. Moving stormwater quickly to gutters, downspouts, catch basins, and pipes increases water quantity and velocity requiring large and expensive drainage infrastructure. Water should be captured in cisterns and ponds, or absorbed in groundwater aquifers and vegetated areas. Remaining water runoff should be slowed down and spread across roof and paved surfaces evenly before entering bioswales and creeks. Perforated drainpipe and filters, and “Green” roofs promote water absorption. “High Performance Schools” promote student safety and security. Visibility of school entrances from main office and general accessibility of the school grounds can affect security. Lighting quality in halls and corridors is also critical. “High Performance Schools “ optimize IEQ by considering it throughout the design and construction process. IEQ includes indoor air quality; acoustics; daylighting; lighting quality; and thermal comfort. Benefits include: reduction in student and teacher absences; increase student performance; reduction of illnesses related to indoor toxins; improved teacher retention rates; reduced distractions; improved comfort levels; and maintenance of healthy students, teachers and staff. Ill health effects associated with poor IEQ can cause students, teachers, and administrative staff to experience a range of acute or chronic symptoms and illnesses including: headaches and fatigue (from VOCs and glare); irritation of eyes, nose, and throat (from VOCs, particles, low relative humidity); respiratory symptoms – allergic reactions (from mold, animal allergens, dust mites); breathing difficulties – increase in asthma symptoms (from allergens, particles, cold); increased transmission rates of colds and flu’s (due to poor ventilation); and poor IEQ can also lead to excessive exposure of classroom occupants to some carcinogens. Important decisions school designers should pay particular attention to key buildings elements: building materials and surfaces (low-emitting for chemicals); ventilation systems (quiet, efficient filters, adequate fresh air); fenestration (adequate and operable windows); site drainage; envelope flashing and caulking; ande ase of maintenance for building components (e.g., floor cleaning, filter changing). Common IEQ problems in classrooms include: excessive levels of volatile organic compounds, like formaldehyde, which can cause eye, nose, and throat irritation and pose cancer risks (these compounds are emitted from new pressed wood materials, and in some other building materials and furnishings, especially in new or remodeled classrooms); although classrooms have individual control of HVAC systems, these systems are often noisy and are not continuously operated (causing large swings in both temperature and humidity levels, and allowing indoor air pollutant levels to build up); moisture problems are sometimes present in roofing, floors, walls, and exterior doors; operable windows are often small or absent; siting can be problematic relative to pollutant and noise sources, poor site drainage, and shading. It is critical to manage and conserve natural resources in “High Performance Schools.” This can be done by reducing carbon dioxide emissions by using renewable energy resources; integration of concerns with design process; building siting and orientation; buildings shape; and landscaping; lighting, heating, cooling and ventilation sources. 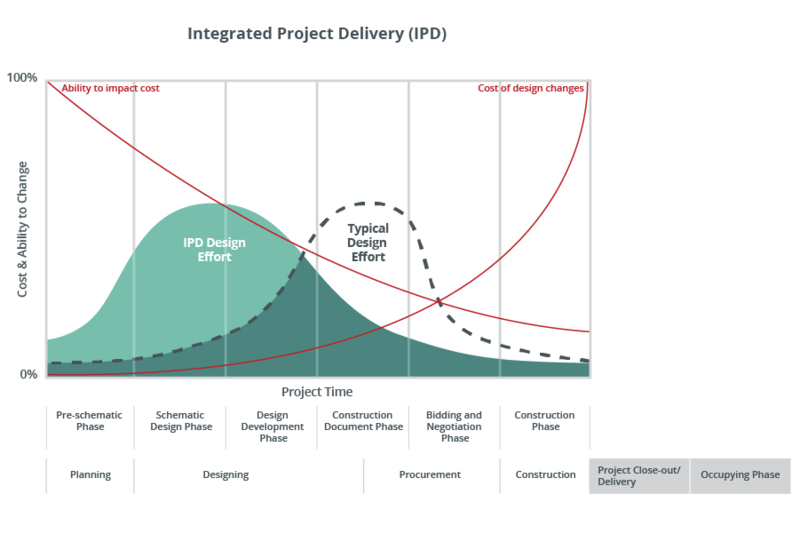 Integrated design can yield long and short-term savings. Reduced heat from an energy efficient lighting system and good natural ventilation designs can reduce the cooling demand, and thus the size and cost of the air conditioning units. All members of the design team should meet early on in the planning process and continue to coordinate integrated design concepts throughout the project in order to reduce energy costs. The end result of integrated design is reduced overall energy consumption, thus saving construction costs through the downsizing of the systems and on-going costs of operation through reduced utility bills. Many programs are available to help schools build energy-efficient facilities. Educate students about energy issues and to install renewable energy systems in schools. By taking advantage of these programs, schools can realize cost savings, better educate their students and help to ensure a cleaner, more stable environment for the future. During the rush to construct new school buildings, districts often focus on short-term construction costs instead of long-term, life-cycle savings. The key to getting a high-performance school is to ask for an energy-efficient design in your request for proposals (RFP) and to select architects who are experienced in making sure that energy considerations are fully addressed in design and construction. Unless a school district directs its architect to design energy-efficient buildings, new schools may be as inefficient as old ones, or they may incorporate only modest energy efficiency measures. Total construction costs for energy-efficient schools are often the same as costs for traditional schools, but most architects acknowledge a slight increase in the capital costs maybe necessary (as some energy efficient building features may cost more.) Efficient buildings have reduced building energy loads and take better advantage of local climate. A properly day lit school, for example, with reduced electrical lighting usage and energy efficient windows can permit downsized cooling equipment. Savings from this equipment helps defer costs of daylighting features. Even when construction costs are higher, resulting annual energy cost savings can pay for additional upfront capital costs quickly. Older “cool” fluorescents had low quality of light that gives human skin a sickly bluish color. Newer fluorescent lights are both higher light quality and higher efficacy. Daylight, the highest quality of light, can help reduce energy use if the lighting system is properly integrated, with ambient light sensors and dimming mechanisms. The design and construction of a school’s daylighting systems can cost more money. Properly day lit school (with associated reduced electrical lighting usage) can lead to downsized cooling equipment. The savings from this smaller equipment helps defer the costs of the daylighting features. Hiring an architect or engineering firm that is experienced in good daylighting design, especially in schools, will minimize any additional costs from the design end of a project. As with any building feature, effective daylighting requires good design. Today’s window technology and proven design practices can ensure that daylighting does not cause distributive glare or temperature swings. Exterior overhangs and interior cloth baffles (hung in skylight wells) eliminate direct sunlight, while letting evenly distributed daylight into rooms. “Daylight” is in effect controlled “sunlight” manipulated to provide useful natural light to classroom activities. Moreover, daylight by nature produces less heat than that given off by artificial lighting. The application of daylighting without control of sun penetration and/or without photo controls for electric lights can actually increase energy use. Design for daylighting utilizes many techniques to increase light gain while minimizing the heat gain, making it different from passive solar in a number of ways. First of all, the fenestration (or glazing) of the windows is different. In a day lit building, the glazing is designed to let in the full spectrum of visible light, but block out both ultra violet and infrared light. Whereas, in a passive solar building, the fenestration allows for the full spectrum of light to enter the building (including UV and Infra red), but the windows are designed to trap the heat inside the building. In addition, in day lit rooms, it is undesirable to allow sunlight in through the window. Instead, it is important to capture ambient daylight, which is much more diffusing than sunlight, this is often achieved by blocking direct southern exposure, and optimizing shaded light and northern exposure. Passive solar maximizes south facing windows, and minimizes north-facing windows, thus increasing heat gain, and minimizing heat loss. As population growth increases demand for water increases. A “High Performance School” must reduce water consumption and use limited water resources wisely. This can be achieved by utilizing: water-efficient landscape techniques; water-efficient fixtures and controls in indoor and outdoor plumbing systems. The largest use of water in schools is in cooling and heating systems (evaporative cooling systems, single-pass cooling systems, etc. ), kitchens, maintenance operations, landscaping irrigation, locker rooms, and restrooms. Good landscaping design including specifying native plants, proper spacing, and low-flow irrigation (that runs at night) will reduce a school’s water demand and expenditures. High-efficiency irrigation technologies such as micro-irrigation, moisture sensors, or weather data-based controllers save water by reducing evaporation and operating only when needed. In urban areas, municipally supplied, reclaimed water is an available, less-expensive, and equally effective source for irrigation. The siting of a school and the shape of the land upon which is resides have tremendous impact on water resources. Selecting drought-tolerant plants will naturally lessen the requirement for water. In addition, using mulch around plants will help reduce evaporation, resulting in decreased need for watering plants or trees. Drip irrigation systems with efficiencies of up to 95% rather conventional spray systems with efficiencies of only 50 to 60%. The treatment of sewage is a costly process taken on by the local utility at the customer’s expense. The wastewater is typically treated and released back to the environment. Waste materials extracted from the wastewater must be further disposed of according to local codes. Considering on site water treatment will reduce the load on the local utility, offer an opportunity for students to learn about the biological and chemical processes involved in water treatment, and reduce operational expenses by avoiding a utility bill. Greywater is water that has been used in sinks, drinking fountains, and showers. Black water is water that has been used in toilets. Greywater is fairly simple and safe to clean and reuse, whereas there are more health risks associated with black water. “High Performance Schools” utilize material efficiency, which includes durable, reused, salvaged, and refurbished or recycled content. Recyclable materials manufactured using environmentally friendly practices. Material efficiency can often save schools money by reducing the need to buy new materials and by reducing the amount of waste taken to the landfill. “high Performance Schools can reduce the amount of materials needed by: reusing onsite materials; eliminating waste created in the construction and demolition process; choosing materials that are safe, healthy, aesthetically pleasing, environmentally preferable, and contain low embodied energy. Waste reduction planning is essential for school districts. These wastes represent a significant loss of natural resources and school district funds as well as a potential threat to student/staff health and the environment. To be responsible stewards of environmental quality, school districts should review new school construction, processes and operations, and even curriculum choices and evaluate the economic, educational, and environmental benefits of implementing effective waste reduction measures. Incorporating waste reduction as part of the school district’s overall way of doing business can provide a number of important benefits: reduced disposal costs; improved worker safety; reduced long-term liability; increased efficiency of school operations; and decreased associated purchasing costs. Building materials may have a number of associated operating costs beyond the straightforward, initial capital costs. Proper selection is essential to minimize these secondary costs. Building materials may pose future health hazards, costing schools absentee time and lost student and faculty productivity. Consider the dangers of volatile organic compounds, dust, and moisture when selecting materials. Keeping these indoor pollutants at a minimum will ensure a healthy indoor environment and improve the learning environment. Consider also the composition of the materials and how recyclable, durable, and refinishable they are. Keeping each of these characteristics in mind when selecting materials, the building will provide better service and reduce maintenance and operating costs. Source building materials from local distributors and save transportation energy costs if possible. Transportation costs are sometimes referred to as part of a material’s embodied cost (and energy). Purchase building materials with low embodied costs such as local regional certified wood harvested from sustainable and well-managed forests. Onsite waste reduction and reuse during demolition and construction can save money by reducing amount of money spent at landfill, and by reducing initial amount of money spent on new materials. Save on labor costs by providing a Construction and Demolition waste plans before starting operations and identifying where to recycle materials and what materials to salvage. The location where a “High Performance School” is constructed impacts the surrounding community. It can affect pedestrian and automobile traffic; quantity and quality of open space in the neighborhood; location within the community; and may be used as a tool to revitalize a community. Once the school site is determined, the school’s design, construction, and use should be considered. Aspects such as the exterior design, amenities that it may provide and environmental design features can be a source of pride to the community. Schools can be a center for teaching and learning, and also add functional value within the community by providing access to facilities and play fields, and services such as after-school daycare and extended education. High performance design for schools can be a selling point in bond elections because energy, indoor air quality, and other improvements translate to more comfortable classrooms for students, reduced energy bills, and lower operating and maintenance costs. Schools become healthier learning environments, reduce waste, and have less impact on the environment. Good indoor environmental quality has been proven to increase average daily attendance of students. Challenges include: tight budgets; an ever-increasing student enrollment; growing need for the renovation and building of many schools; higher expectation of faculty and student performance among these compelling circumstances. Sustainable schools can have a favorable impact on the school’s budget; help protect our environment; and encourage better performance of faculty and students as a result of a better learning environment. “High Performance Schools” integrate today’s best technologies with architectural design strategies to achieve a better learning environment. These include: lighting – integration of daylighting and electrical lighting technologies; reduced noise levels by using acoustic materials and low-noise mechanical systems; healthy air quality, temperature, humidity levels – indoor air quality; thermal comfort; HVAC systems; low-emission materials; and reduce distractions and create environments where students and teachers can see and communicate with one another clearly and comfortably. Without properly commissioning a school, many sustainable design elements can be compromised. In the American Society of Heating Refrigerating and Air-Conditioning Engineers (ASHRAE) Guideline, The Commissioning Process is defined as follows: “The Commissioning Process is a quality-oriented process for achieving, verifying, and documenting that the performance of facilities, systems, and assemblies meet defined objectives and criteria. The Commissioning Process begins at project inception (during the pre-design phase) and continues for the life of the facility through the occupancy and operation phase. The commissioning process includes specific tasks to be conducted during each phase in order to verify that design, construction, and training meets the Owner’s Project Requirements.” By implementing a commissioning plan, a school can be sure that all of the systems function at optimum levels. Building and its systems are tested one year after completion and occupancy. Surveys are conducted to evaluate the satisfaction of occupants and maintenance and operations personnel. Alert school to system operational performance errors and potential hazards created by poorly operating systems. These problems can be corrected. Data can be provided to school districts on what building attributes do and don’t work for their schools. Schools can develop guidelines and protocols that can help create better schools in the future. Benefits include higher test scores, increased average daily attendance, increased teacher satisfaction and retention, reduced liability exposure, and sustainable school design. Total construction costs for high performance schools are often the same as costs for conventional schools. Design costs may be slighting higher, but resulting capital and long-term operation costs can be lower. Properly designed day lit school with reduced electrical lighting usage can permit downsized cooling equipment. Even when construction costs are higher, resulting annual operational cost savings can pay for the additional upfront in a short period of time. High performance schools are falsely understood to be high-budget construction projects. Schools can find ways to finance a school beyond the State Allocation Board process. A collection of financial incentives in relation to energy, water, materials, siting, green building, landscaping and transportation from the Federal, State, Local, and Utility sectors may be available. – Maximize land, views, lighting, wind, water elements, other natural features, etc. – Selection of Materials – Reuse, Recycling, Renewable sources, etc. @FC3ARCHITECTURE – Going Green? We Can help! William Martin of Westwood received an award for his work on a Hillsdale home for a wounded soldier. Westwood resident William Martin, who has been working as an independent architect since 1991, recently won an award for a sustainable home design he created for a wounded soldier. The American Institute of Architects New Jersey Committee on the Environment (COTE) held its first competition this year to reward architects for outstanding sustainable designs. Martin submitted his project in the residential category and was named the winner in the COTE Top 10 Awards. The design is for a home in Hillsdale that Martin did in conjunction with Homes For Our Troops. Wounded Iraq War Marine Corp. Cpl. Visnu Gonzalez lives in the home with his mother, Maria. The home, which was constructed in 2009, has several green elements. It is LEED (Leadership in Energy and Environmental Design) Platinum Certified and is partially self-sustaining by creating its own renewable energy. The house has solar panels, geothermal heating and air conditioning, LED lighting and a mechanism for rain water capture and re-use. Martin appeared on NBC News with Brian Williams for his efforts on the home. Click here to see the segment. The built environment is the major source of global demand for energy and materials that produce by-product greenhouse gases (GHG). Planning decisions not only affect building energy consumptions and GHG emissions, but transportation energy consumption and water use as well, both of which have large environmental implications. All new and renovated developments / neighborhoods / towns / cities / regions immediately adopt and implement a 60% reduction standard below the regional average for fossil-fuel operating energy consumption for new and renovated buildings and infrastructure and a 50% fossil-fuel reduction standard for the embodied energy consumption of materials. 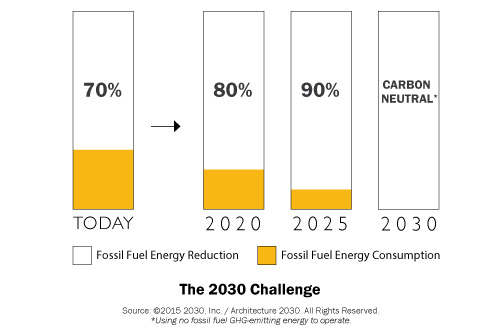 Carbon-neutral in 2030 (using no fossil fuel GHG emitting energy to operate or construct). These targets may be accomplished by implementing innovative sustainable design strategies, generating on-site renewable power and/or purchasing renewable energy (20% maximum). Click here for more information on Architecture 2030. Architecture 2030, a non-profit, non-partisan and independent organization, was established in response to the climate change crisis by architect Edward Mazria in 2002. 2030’s mission is to rapidly transform the U.S. and global Building Sector from the major contributor of greenhouse gas emissions to a central part of the solution to the climate change, energy consumption, and economic crises. Our goal is straightforward: to achieve a dramatic reduction in the climate-change-causing greenhouse gas (GHG) emissions of the Building Sector by changing the way buildings and developments are planned, designed and constructed. Buildings are the major source of global demand for energy and materials that produce by-product greenhouse gases (GHG). Slowing the growth rate of GHG emissions and then reversing it is the key to addressing climate change and keeping global average temperature below 2°C above pre-industrial levels. All new buildings, developments and major renovations shall be designed to meet a fossil fuel, GHG-emitting, energy consumption performance standard of 60% below the regional (or country) average for that building type. At a minimum, an equal amount of existing building area shall be renovated annually to meet a fossil fuel, GHG-emitting, energy consumption performance standard of 60% of the regional (or country) average for that building type. Carbon-neutral in 2030 (using no fossil fuel GHG emitting energy to operate). These targets may be accomplished by implementing innovative sustainable design strategies, generating on-site renewable power and/or purchasing (20% maximum) renewable energy.